Once again (or, may be, it has turned into a norm ) my children were busy in their jobs/study leaving, only us, the folks, the parents. We both were already determined and my Prado 96 set for the adventure so the “Trip Check List” came into action. This is a gross check list. The items for each trip are short listed from this list according to needs. As I was in the program lot earlier, so, I carried out several improvements in my ride. New tires, new batteries, new wirings, new dash-board computer, new turbo-charger, and, new fuel injection pump. The house-hold preparations included water-gallons, gas-filling in stove, emergency light, torch, basic tools, and a number of items of daily use and consumption. I have made a long, gross, check-list of trip items that helps me to short-list and pack-up necessary items from that gross list according to duration and nature of trip. Please never forget to carry your original CNIC with you. There are a number of check-posts on the way where your CNIC is checked and the detail is entered in registers. There is no issue at all if you have original CNIC. The 2nd most important thing is to carry original registration book of your vehicle and also do verify its engine number and chassis number by yourself before departure. If you are riding an official vehicle, then, do make an Authority Letter for the trip. 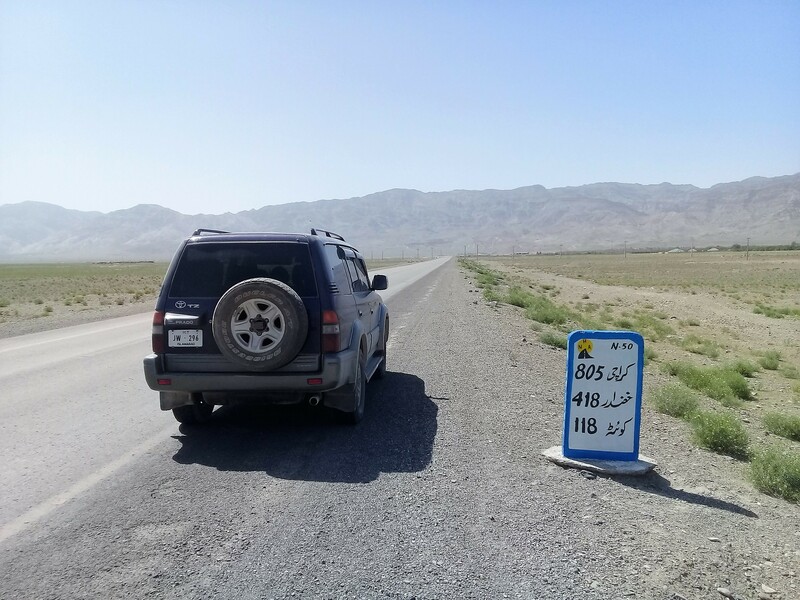 Normal duty slip is usually not acceptable by the FC Check-post at Balochistan provincial border. 3.1. Eight-day trip started from Multi-gardens, B-17, Islamabad at 08:15 am on Saturday, April 28, 2018 and ended back at B-17 on Saturday, May 05, 2018 at 05:45 pm. 3.2. 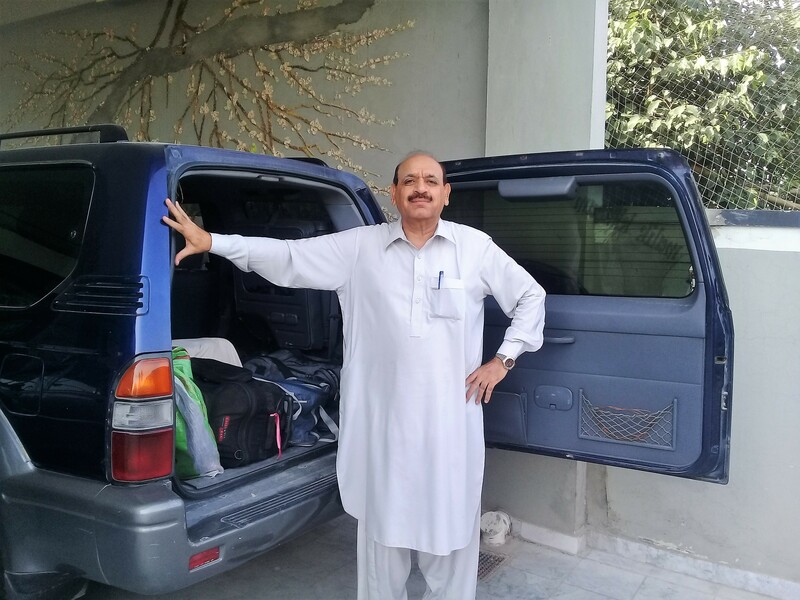 There were 7 nights in the trip, first at Dera Ismail Khan, 2nd-6th at Quetta Cantonment and, while returning to Islamabad, 7th night, again, at Dera Ismail Khan. 3.3. Total distance travelled from home to back- home was around 2200 kilometers, which I drove myself, and, the total diesel consumed was 288 liters, costing Rs.28500 giving an overall average of 7.64 km/liter or Rs.13/km. 3.4. The distance from Islamabad (residence) to Quetta (residence) was 915 km and the net driving time was 14.5 hours, giving an average travelling speed of 63 km per hour. 3.5. The amount consumed on room-rent, food and miscellaneous necessities was Rs.23000. However, Quetta is quite attractive for shopping, therefore a handsome amount had to be set aside for shopping. That amount need not to be mentioned here, just beware of this expenditure friends, if you are travelling with family. 3.6. Grand total of expenditure on this 2-persons, 2200 km, 8-days trip on Prado-96 was Rs.51500/-, excluding shopping. 3.7. There was, comparatively, not much spent on room rent because two nights in Dera Ismail Khan and five nights, spent in Quetta Cantonment, were in official guest houses costing nominal charges. The average cost of each meal for two persons was Rs.450/- and the overall average of the trip cost was Rs.6500 per day. 3.8. Generally speaking, the 915 km road from Islamabad to Quetta is quite good, in Pakistani sense. 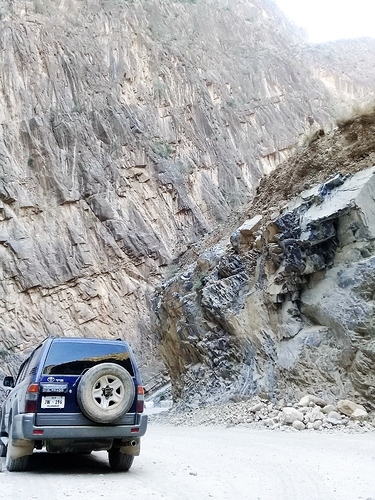 However, there are two exceptions: 1st : the 65-70 km patch of Koh-e-Suleman, between DI Khan and Zhob, from Dara-Zinda to Dhana-Sar, is not good, especially 10-15 km mountain road between Mughal Kot and Dhana Sar is under construction and very bad to drive-through during working hours ; 2nd : the 330+ km road between Zhob and Quetta is excellent. 3.9. ATM cards were frequently used in Quetta without any difficulty. 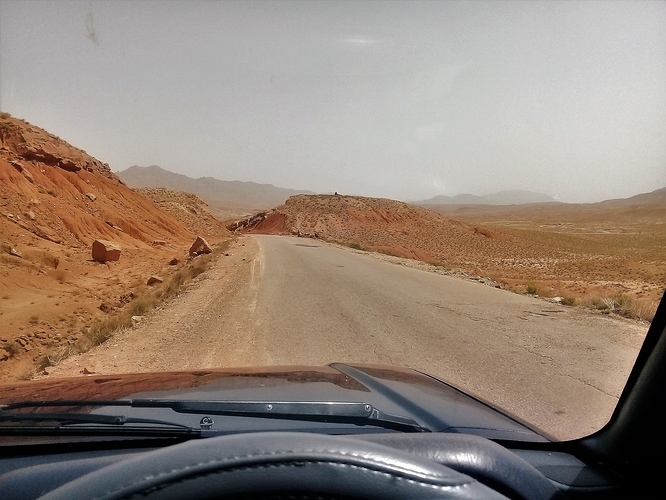 Mobile phone signals, especially TELENOR are mostly present throughout the journey, except for Koh-e-Suleman region between Daraaban and Zhob and for some barren areas between Zhob and Qila Saif Ullah. 4.1. 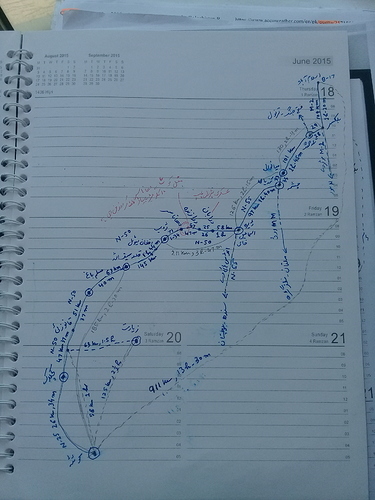 On Saturday, 28th April, we started the journey at 08:15 am from home in Multi-gardens, B-17, Islamabad, on to Motor-way, M-2 section for Balkasar, after setting the trip-meter to zero. It took us 115 km and 01:15 hour to reach Balkasar-interchange at 09:30 am. 4.2. 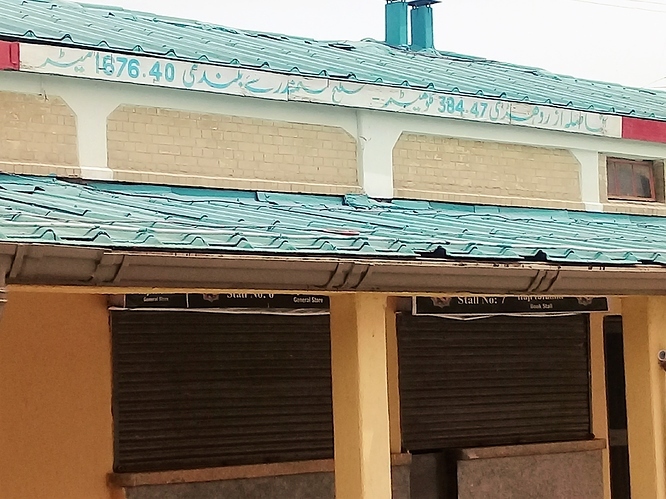 At Balkasar interchange, we left Motor-way and turned to Talagang, onwards to Mianwali road. Talagang is around 30 km from Balkasar interchange and we crossed it after 30 minutes at 10:00 am. Please remember to turn right, just before the city, on bypass road, instead of plunging through the city to avoid traffic-rush in the city. 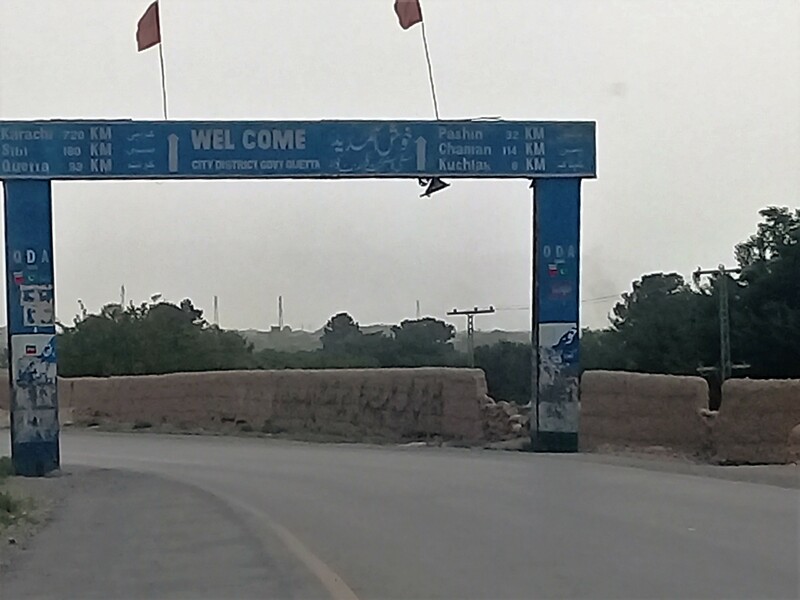 The by-pass road makes half circle around the city and joins again on Mianwali road. During this half circle by-pass, there will be a right turn, almost half-way through, to Fateh-Jang-Rawalpindi road. Don’t take turn to this road and stick to by-pass for Mianwali road. 4.3. After turning right from Talagang by-pass road to Mianwali road, there is an “Awan International Hotel” on right side of the road. This is a reasonable place for break-journey, tea, meal and prayers etc. I have stopped at this hotel a number of times. We reached this hotel at 10:15 am, stayed there for 15 minutes, had tea, refreshed ourselves and moved on. 4.4. As we were on a provincial highway, I couldn’t find a National highway code for this road. 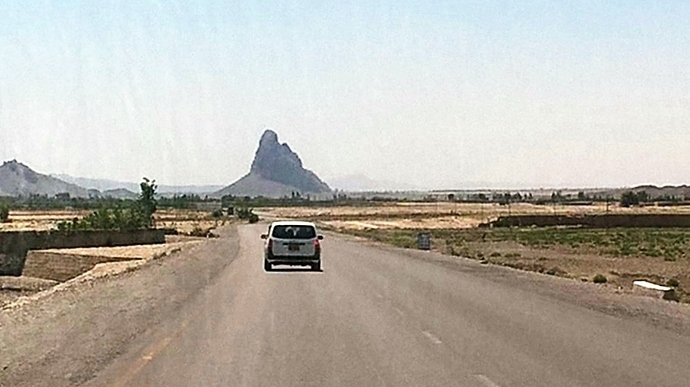 The trip meter was at 235 km when we entered Mianwali and the time was 12:05 pm (Noon). 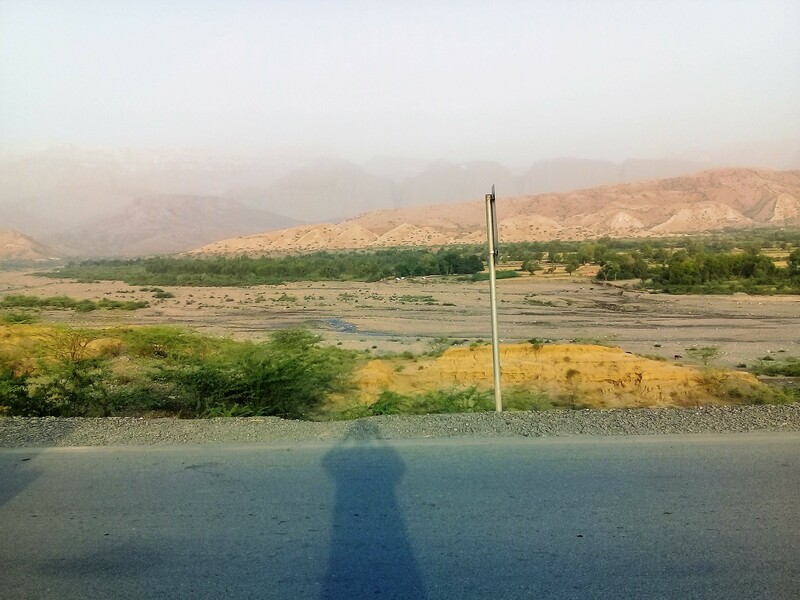 Before reaching Mianwali, we crossed NAMAL College on our left side and then the hills of Musa Khel. It took us 3 hours and 50 minutes from home to Mianwali. 4.5. Chashma Barrage is 35 km from Mianwali and a crossing point between Punjab and KPK. We reached here with trip meter at 270 km, got Prado’s diesel tank filled and then crossed the Barrage at 12:50 pm. 4.6. 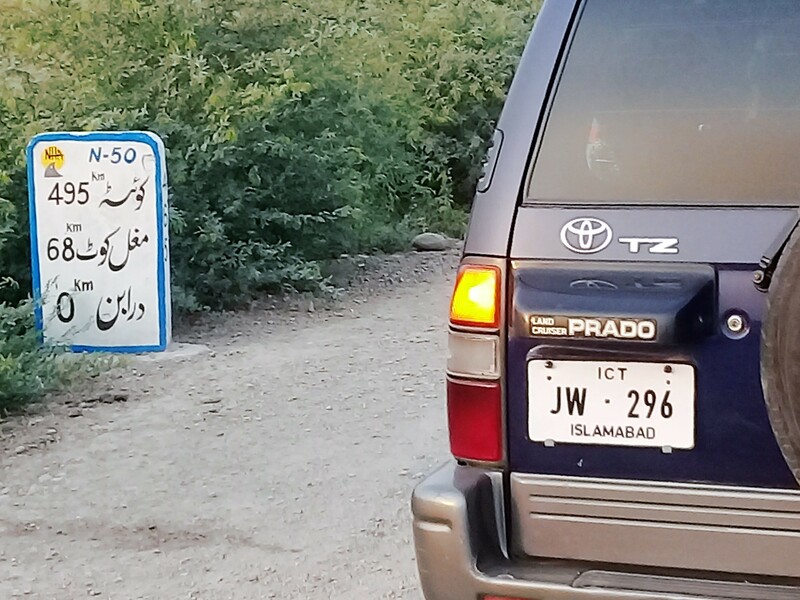 By crossing Chashma Barrage, we left District “Mianwali” of Punjab and entered District “Dera Ismail Khan” of KPK. 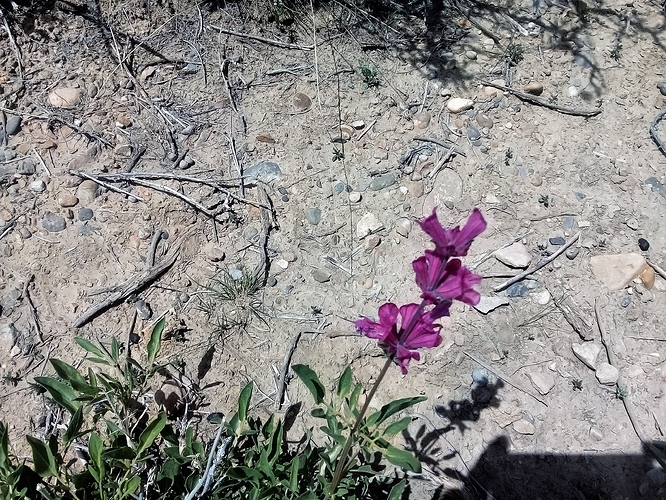 There is a noticeable change in appearance and attitude of people on two sides of the Barrage. There was a police check-post at the crossing. They were stopping selected vehicles, nevertheless, they didn’t stop us. 4.7. We reached Dera Ismail Khan City at 02:00 pm and trip meter at 361 km. 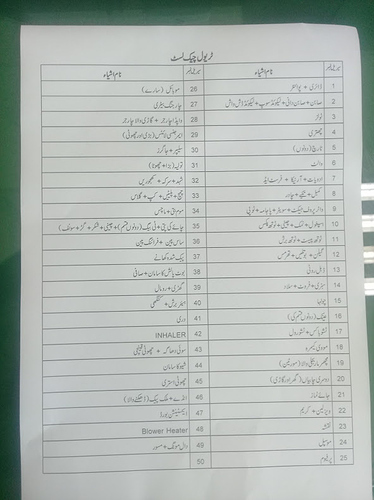 Now, started looking for a famous place “Mufti Mehmood Hospital” on “Daraaban” road, where we had a booking in a nearby rest house. There was an option of turning right on a bypass road instead of entering the city. But we entered the city as we had wrongly judged the location of said hospital. It took us 75 minutes and several liters of Diesel to wind through the busy city roads and streets to reach the destination. The bypass road would had taken only 20 minutes for that. As we stayed in the same rest house on our return journey, it took us only 20 minutes to encircle the city and reach the Chashma-Dhakki road. 4.8. 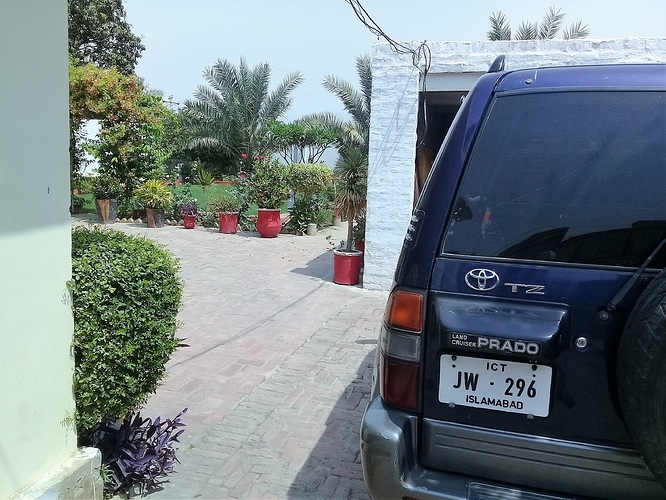 We stayed at DIK rest house, inside Mufti Mehmood Hospital, right on Daraaban road, for our first night of travelling and also managed to get Prado washed by a local worker. Meanwhile, my dear friend, Tahir Saeed, along with his wife, reached from Jauharabad at around 09:00 pm. He was riding his Honda City, 2017, driven by his driver. From now on, he would company us for the Quetta trip, only to depart again at D.I. Khan on our return journey. 4.9. 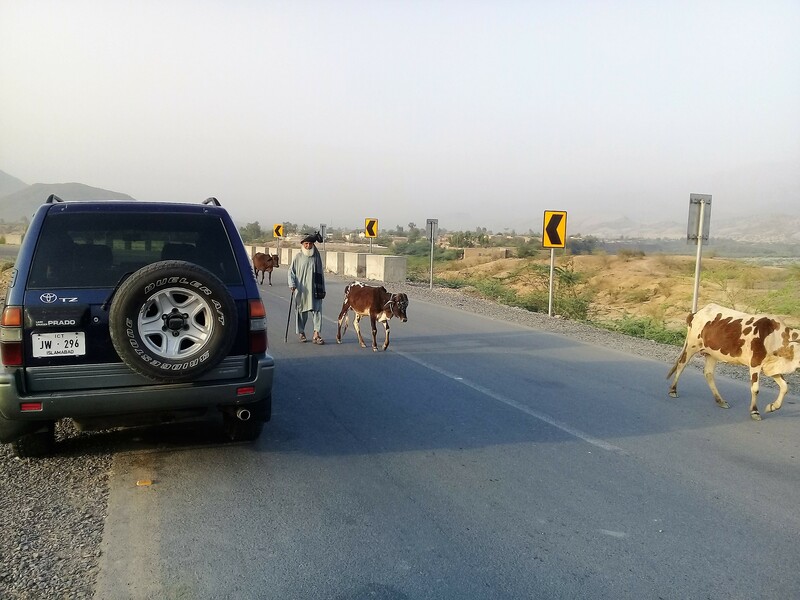 Next morning, Sunday, April 29th, we got up early and left Dera Ismail Khan for Zhob at 05:35 am and trip meter at 378 km, on “Daraaban” road onward to Zhob. 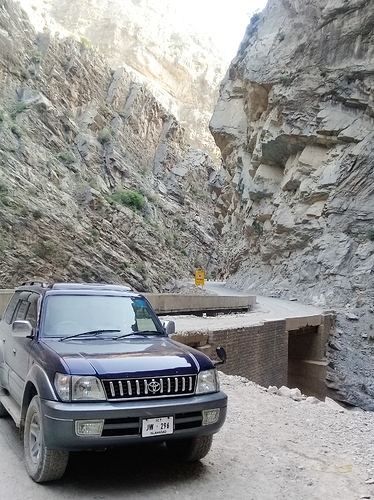 The aim was to reach Mughal Kot, at 130 km, before 08:00 am, so that we could cross the 10-15 km road in mountain blasting area before start of blasting work. Otherwise, they stop the traffic on both sides for several hours. 4.10. From Islamabad to Daraaban, except for 15-20 km of barren patch between Chashma and Dhakki, we could see greenery on both sides of the road. However, after Daraaban, greenery started to decrease and then almost barren landscape started with only scattered bushes and very low tree population. 4.11. We crossed “Daraaban” at 424 km of trip meter and 06:15 am. 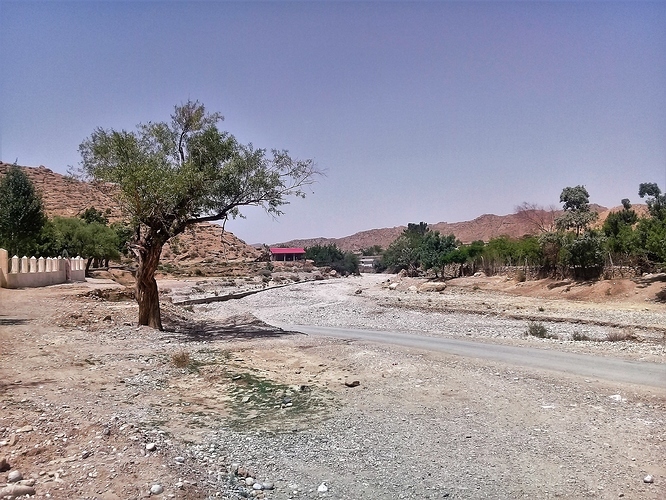 Daraaban is the last city of District Dera Ismail Khan before entering Tribal Area of Southern Waziristan. 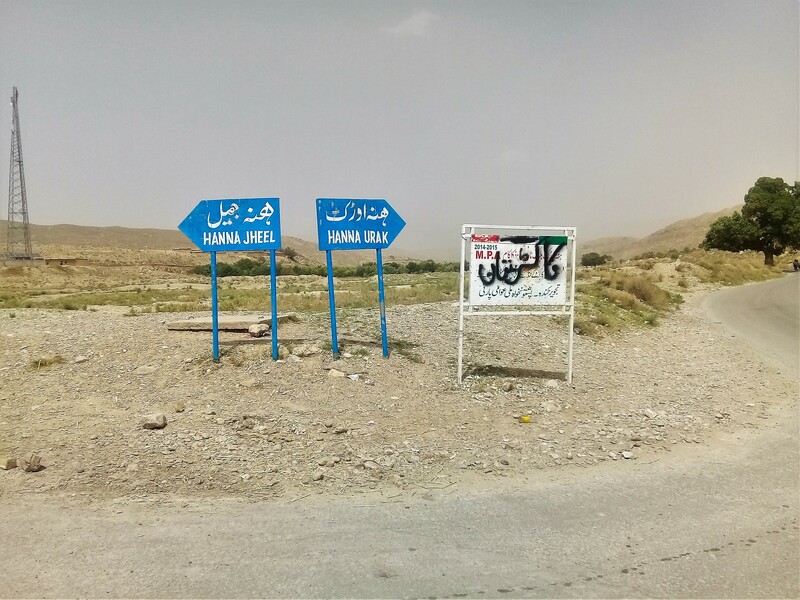 The Zhob road passes through Tribal Area for some 80 km before entering District “Sherani” of Balochistan province. Although, we heard the rumors of insecurity in this area, we did not feel any insecurity or risk in this part of Tribal Area. Everything seemed normal and usual, except the road condition that turned from good to not-good to poor onto bad. In Tribal Area, at 22 km from Daraaban came “Dara-Zinda” and then Mughal Kot at 43 km from Dara-Zinda. 4.12. Despite my efforts, we got late by 15 minutes when we reached blasting area of Mughal Kot at 08:15 am. Luckily, the highway staff, after stopping us for half an hour, allowed us and a few other vehicles to cross the blasting area. 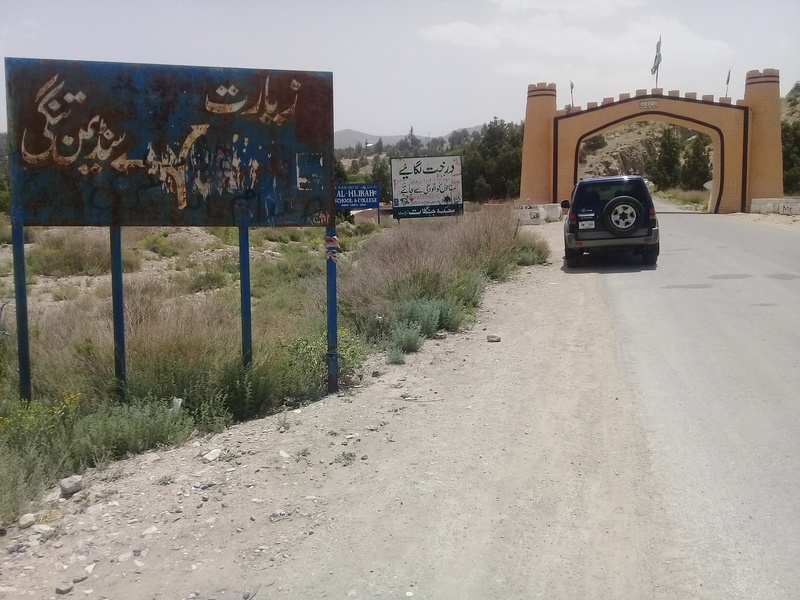 Finally, we crossed that bad part of, under construction, hill road and, after crossing Dhana-Sar, arrived at the FC check-post on the crossing point from, then Tribal Area of Southern Waziristan into District Sherani of Balochistan. 4.13. The FC check-post at this crossing-point is quite a large set up. 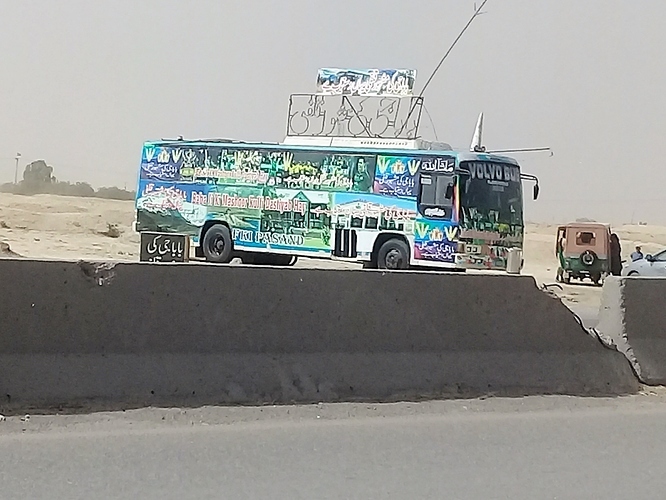 They register all vehicles, their drivers and commuters, entering or leaving Balochistan. They also thoroughly check the registration book of the vehicle and verify engine number and chassis number. The aim is to stop crossing of smuggled, stolen, or tempered vehicles. You could see dozens of seized vehicles in a nearby enclosure. If you note down date and time along with some clue of the serial number/page where your particulars and that of your vehicles are written by the FC-man, it might help you to get their early clearance on your way back. 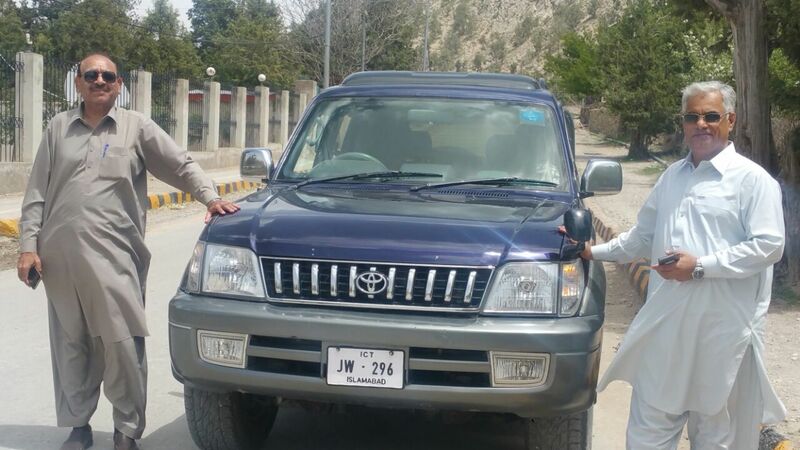 Because checking of the vehicles coming from Balochistan is more vigorous and takes more time. 4.14. After FC check post, soon we were on newly built road that had under-construction bridges, coming frequently. So, after every small interval of flat smooth road, we had to de-track, descend onto and cross un-paved rivulet bed and then ascend again to newly built-road. 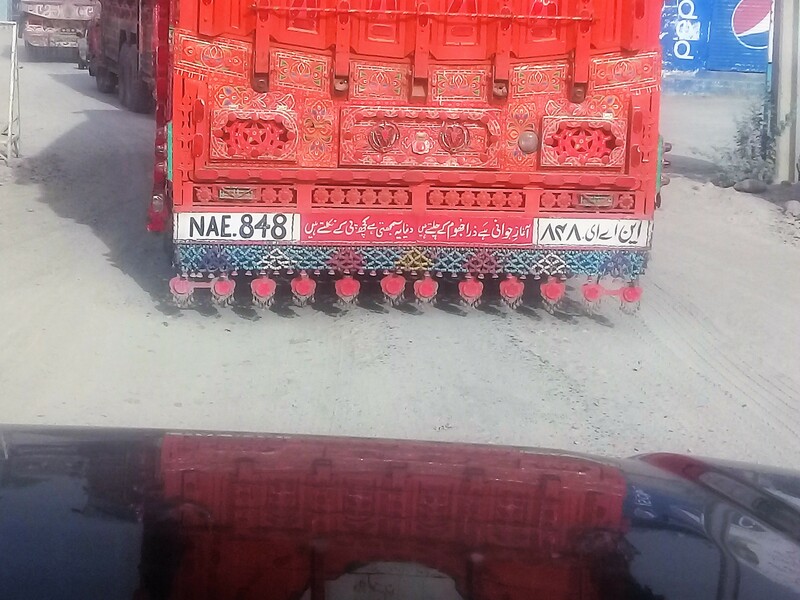 This annoying practice went on for quite some time till we were near Zhob. 4.15. The trip meter was at 573 km and the time was 10:05 am when we reached Zhob, a famous and important city of Balochistan. We had two things on mind. The 1st was to get our fuel tanks refilled. Our last refilling was at Chashma and as verified later, 303 km, Chashma-Zhob section had the worst fuel average because of poor mountain road condition. 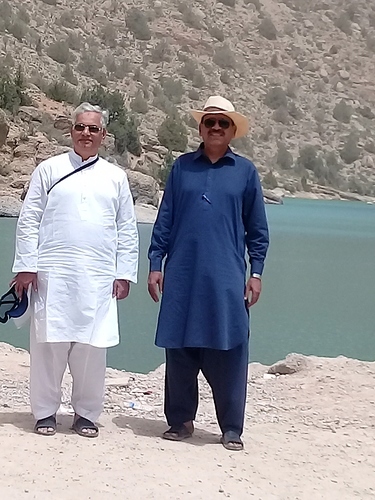 The 2nd and an important activity at Zhob was to meet Mehmood Khan, my dear friend, from “Our Gardens” group at Facebook. Although, we never met before in person. We were Facebook friends, had telephonic contact and I called him when I finalized the Quetta program. 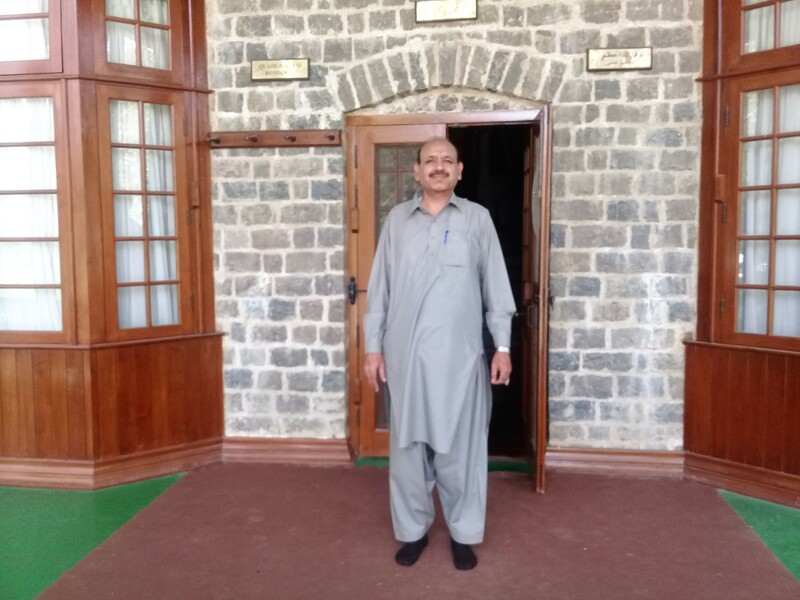 He, very kindly, invited me to make a stop-over at Zhob and to visit his residence. We were in regular contact through cell phone since my departure from Dera Ismail Khan. He had sent his cousin on a meeting point on Quetta road. It took us almost half an hour to locate his cousin, get our fuel tanks filled and reach his beautiful house at the out-skirts of Zhob. 4.16. 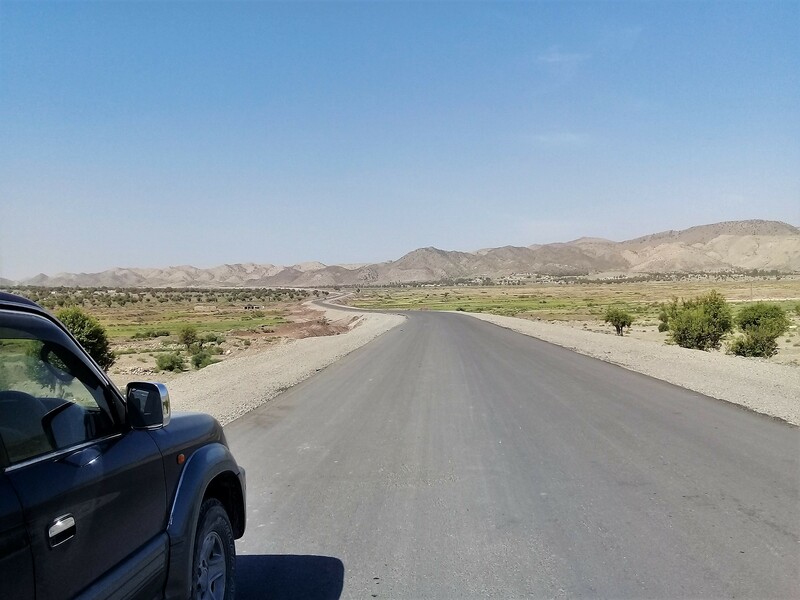 While travelling through the roads and streets of Zhob, we realized that this city is the economic and social hub of that region. It was a pleasant and refreshing experience to pass one and a half hour at our friend’s residence with his friendly family. Starting from detail introduction of our families, we exchanged views on a variety of topics. The discussion was accompanied by multi-dish, lavish and tasty, hi-tea. It was a memorable and wonderful get-together. Before departure, it was a fun to see the beautifully maintained garden of Mehmood Khan. At 12:05 noon, we left Zhob after presenting our profound gratitude to Mehmood Khan and his nice family. 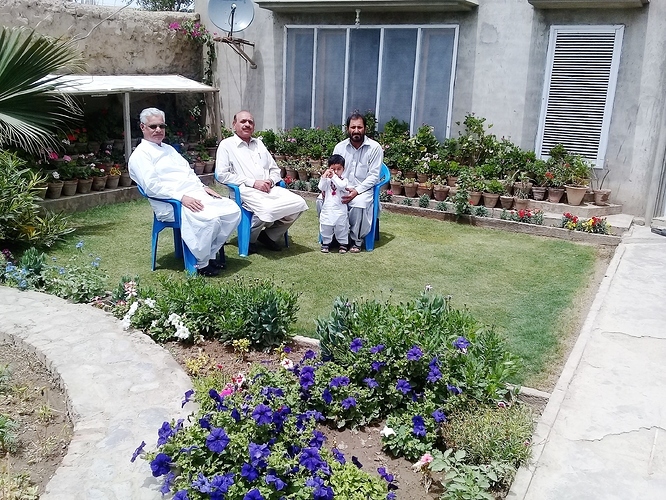 Me, Tahir Saeed and Mehmood Khan, at flower filled beautiful home of Mehmood Khan, in Zhob. We had very warm welcome there and passed joyful and feast-full time with his nice family. 4.17. 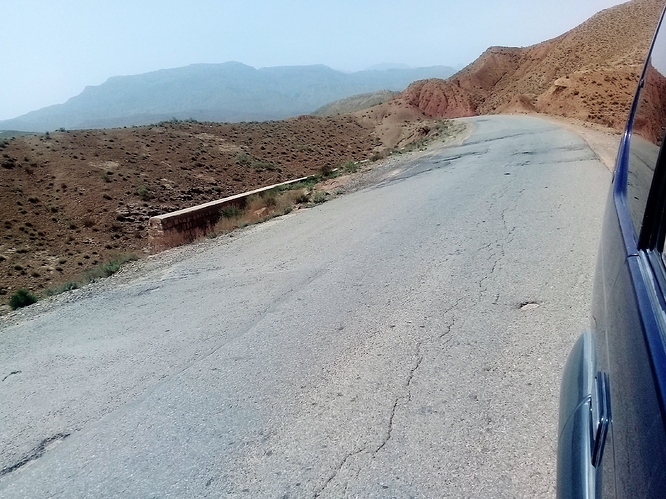 At 12:10 noon, we were again on 330+ km Zhob-Quetta road. This is a newly built and a fun to drive road. There was little to moderate traffic on the road and speed of 100-120 km/hour could be easily maintained. I, however, try to maintain 2000 rpm and a top speed of 100 km/hour to get the best fuel average of my Prado. Driving my Prado at 120 ruins the fuel consumption average. 4.18. 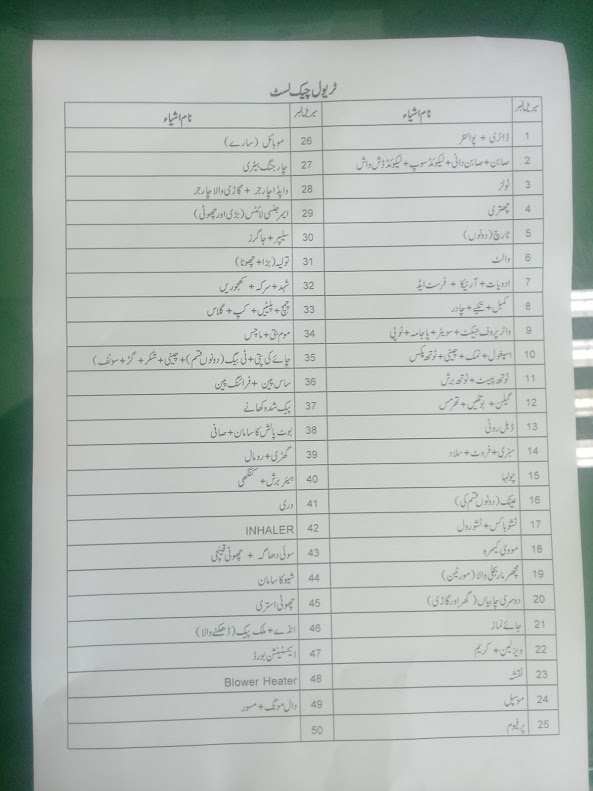 By the mercy of Almighty, we reached Quetta Cantonment, on Sunday, 29th April, at 04:15 pm, after traveling 915 km from Islamabad on our 2nd day of journey. From residence to residence, the net driving time was 14.5 hours. We had booking in a Cantonment Mess for the next 04 nights. The trip meter, zeroed at Islamabad was at 915 kilometers when we reached the Mess. On our way of 400 km from Zhob to Quetta, we passed through Qila Saif Ullah, Muslim Bagh, Kanozai and Kuchlak. 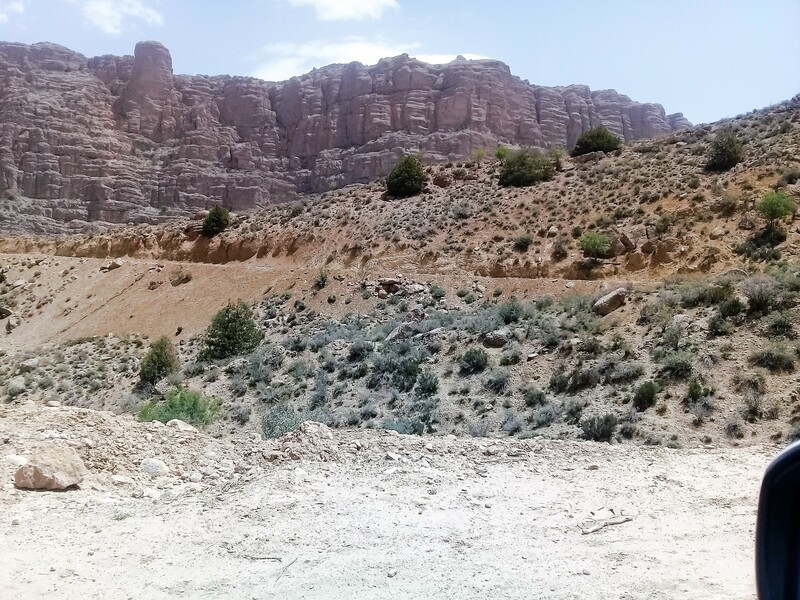 Between Kanozai and Kuchlak, we witnessed a sign-board and a road turning to left side for Ziarat. We would be coming back to this point from Quetta for our Ziarat trip. After dumping the luggage at our nice, comfortable and spacious VIP room at the Cantonment Mess, my first ride was to a nearby petrol pump for refilling of Diesel tank so that I could calculate the diesel consumed from Islamabad to Quetta and the average attained so far. 4.19. 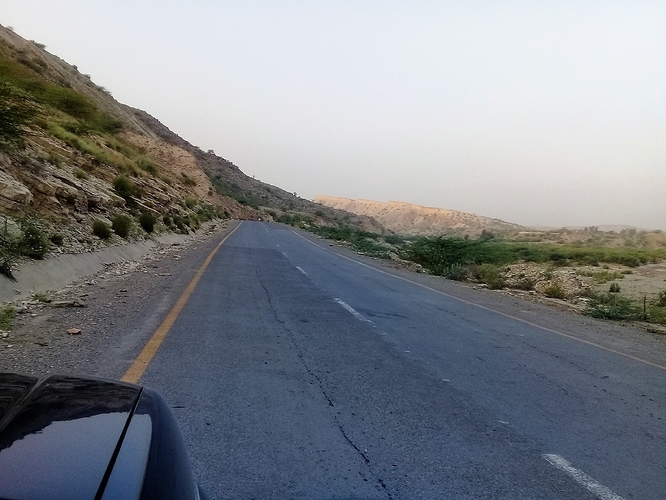 Dear Pak Wheelers, even accompanied by our ladies, there was never a sense of insecurity or risk through-out our ride via this route from Islamabad to Quetta. Interviewing professional drivers on the way revealed that night driving, along with family, is also safe and a common practice through this route. 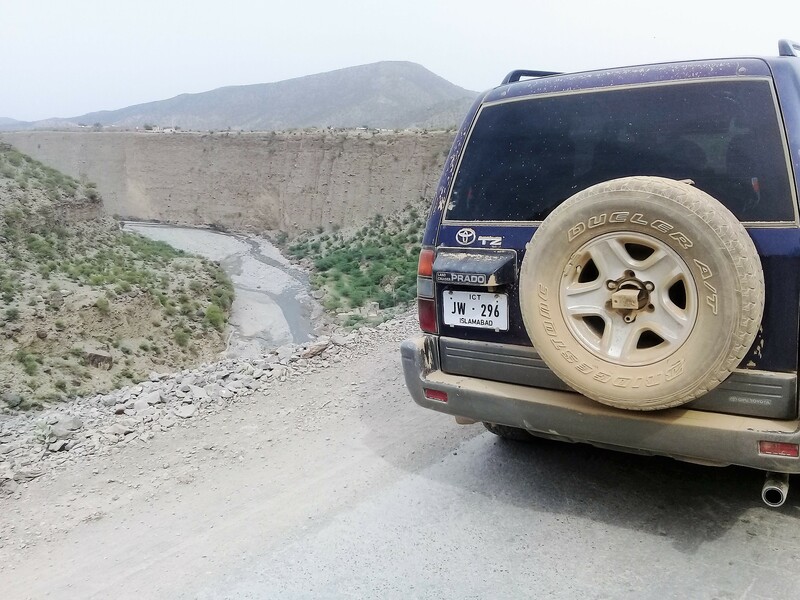 Even the 80 km-something journey through tribal area of South Waziristan was as safe as any settled area. 4.20. In Quetta, the next four days and five nights passed like a dream come true. 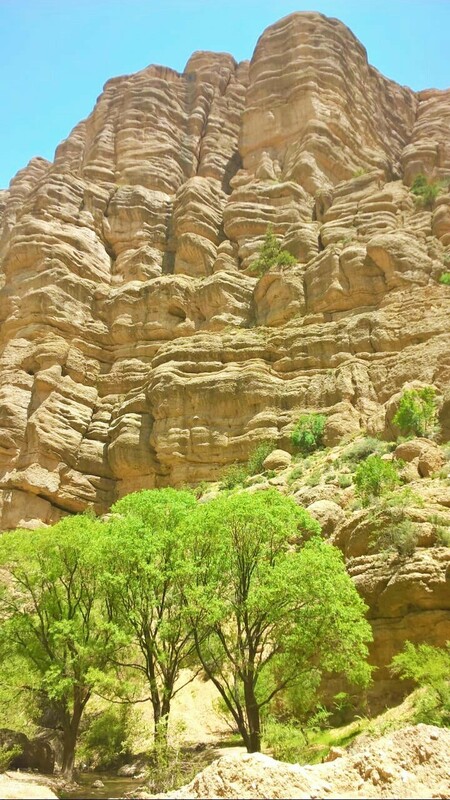 We enjoyed each and every moment of our stay and travelling in and around Quetta. 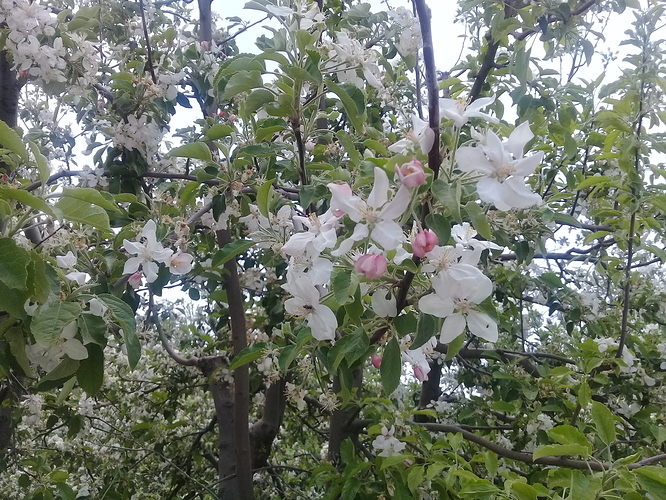 It is a sweet city and we loved it. 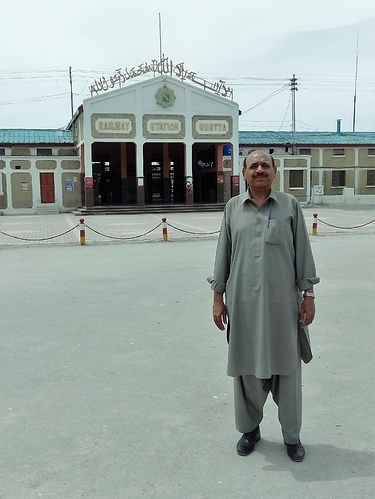 My wife, had passed several years of her school life in Quetta. First day, Monday, 30th April, we visited her former residence in “Survey of Pakistan” Colony on Brewery Road where her family used to live. We also visited her former school, “Railway Colony School”, where she luckily found one of her class fellows working now as school teacher. 4.21. 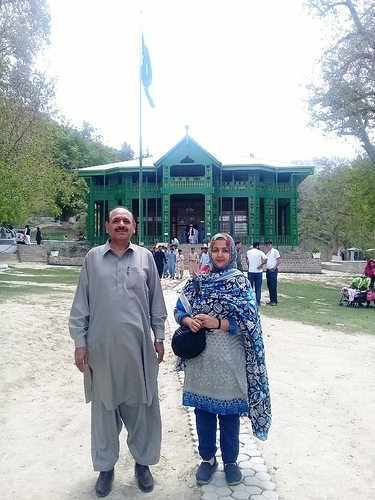 On 2nd day in Quetta, Tuesday 1st May, we visited Ziarat, 124 km from our residence in Quetta. We started the journey at 9:30 am, and, trip meter at 952 km. 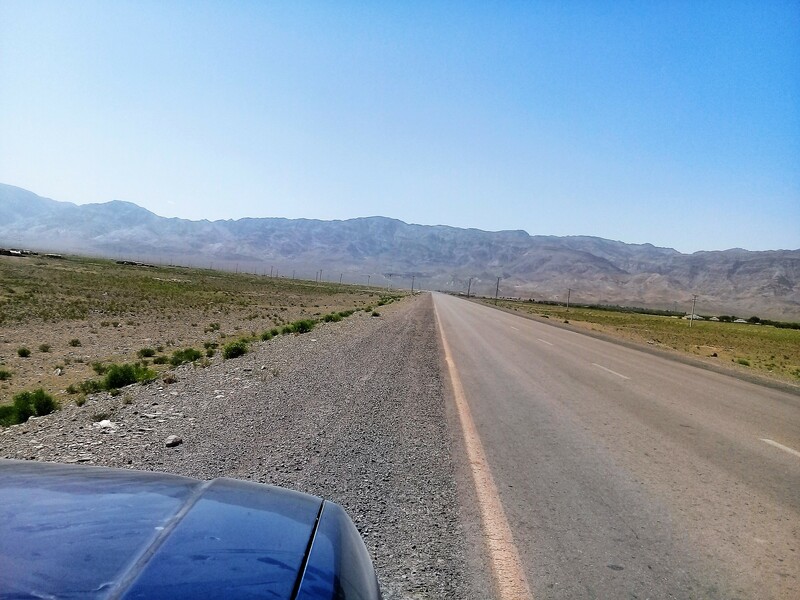 First, we travelled 58 km back on Zhob road, crossed Kuchlak, onward to Ziarat More, and turned, at 10:30 am, to Ziarat road on right side. 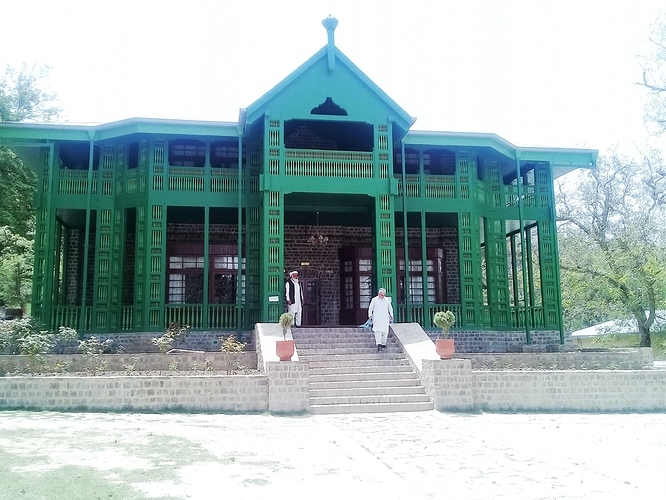 Travelling further 66 km brought us to Quid-e-Azam Residency, Ziarat. The trip meter was at 1076 km and the time was 12:00 noon. At first, we faced disappointment when the FC guard at the gate told us and a few other visitors that the Residency remains closed on every Tuesday. However, we remained persistent and after talking to their local commander, we were allowed to visit. The residency has been rebuilt and renovated after its partial destruction in the recent past. 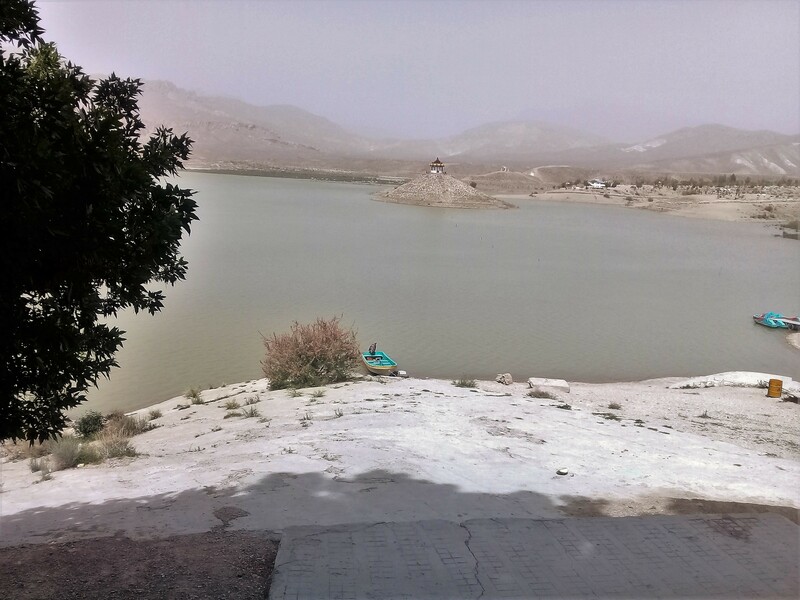 The Residency is a must-visit destination in Quetta, although, we found the forestation, less, and, the Residency, a bit smaller, as compared to our perception made by the old photographs. We headed back at 1:30 pm and reached Quetta at 3:45 pm, while, trip meter was at 1200 km. 4.22. On 3rd day in Quetta, Wednesday, 2nd May, we visited Urak valley, Wali-Tangi Dam and Hanna Lake at the outskirts of Quetta, using Tahir’s Honda City. We enjoyed all these places, however my wife seemed disappointed to see quite low level of water in Hanna Lake, as compared her teenage memories. 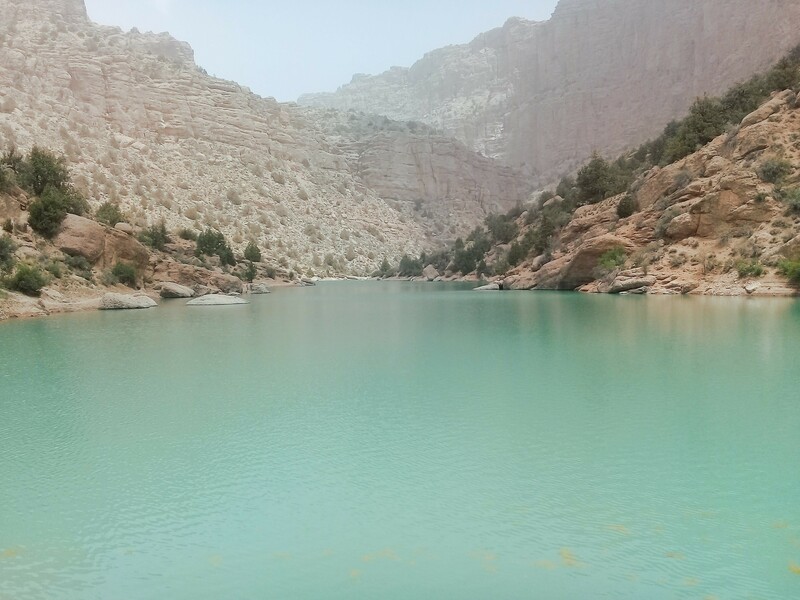 For Wali-Tangi dam, we needed a permit from the local Army commander. 4.23. Like 1st day, our 4th day in Quetta, Thursday, 3rd May, was for local exploration. 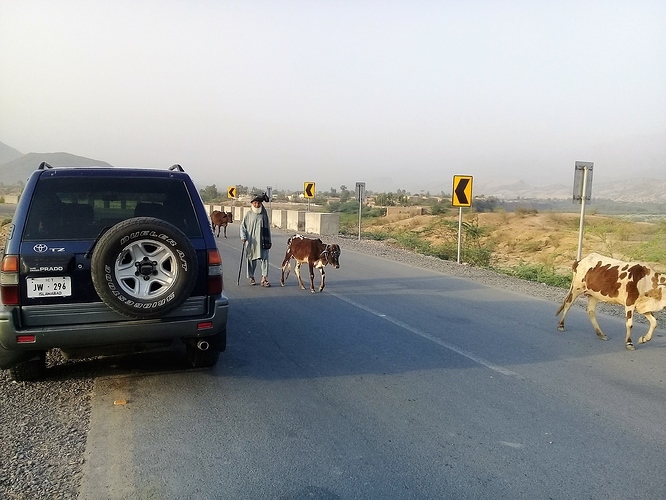 We separated in two teams, me and Tahir Saeed in Prado, visited famous Bazars including NATO Bazar and a dairy farm with 250 cows and buffalos, on reference of a local friend. The ladies accompanied by the wife of a local friend, in Honda City, explored ladies’ shopping areas and did a lot of shopping. 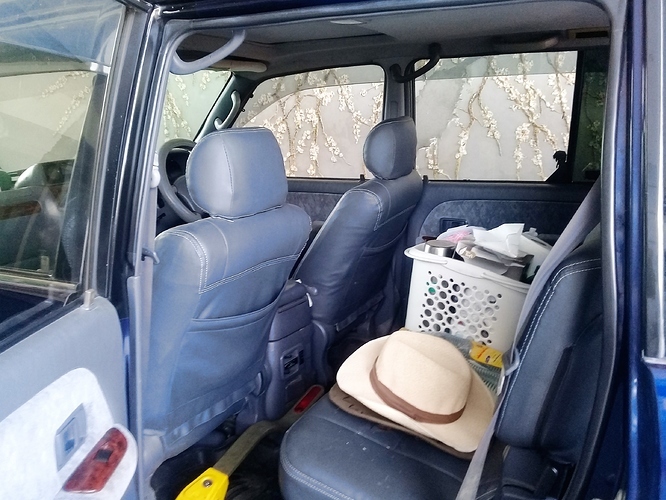 I bought a few things for my Prado and five Chukor birds (Rock Partridge) in 9000 rupees along with a low-cost, light-weight wooden-sticks cage in Rs.500. In addition to Quetta city bazars, we also visited Museum and famous post-1935-eathquake Railway Station. 4.24. We enjoyed nice local environment and cuisine twice at family dinners, once at Quetta Club and 2nd time in a famous local restaurant at Baleli road. I did not carry much cash from Islamabad, therefore, I kept on using ATM card on almost daily basis without any difficulty. 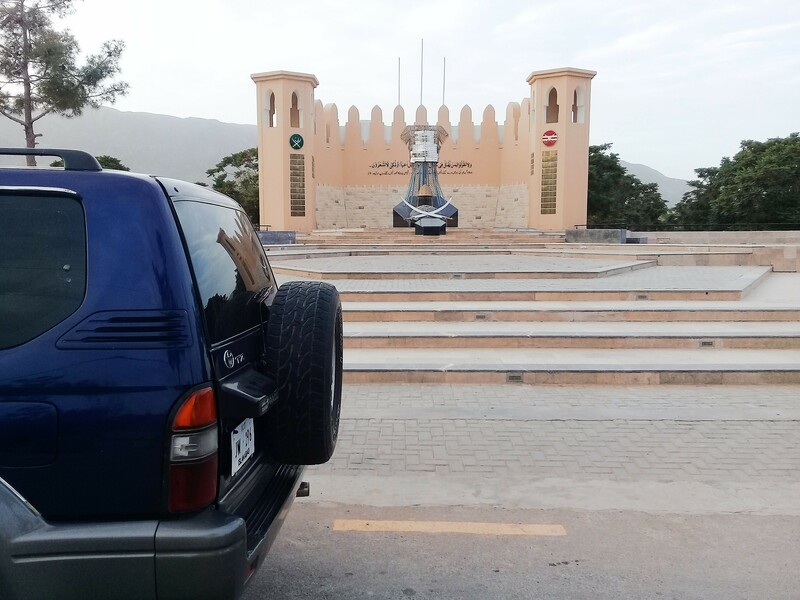 In the evening of our 4th and the last day at Quetta, I got my Prado washed, tires’ pressure checked and diesel tank refilled to full capacity for our departure next morning. 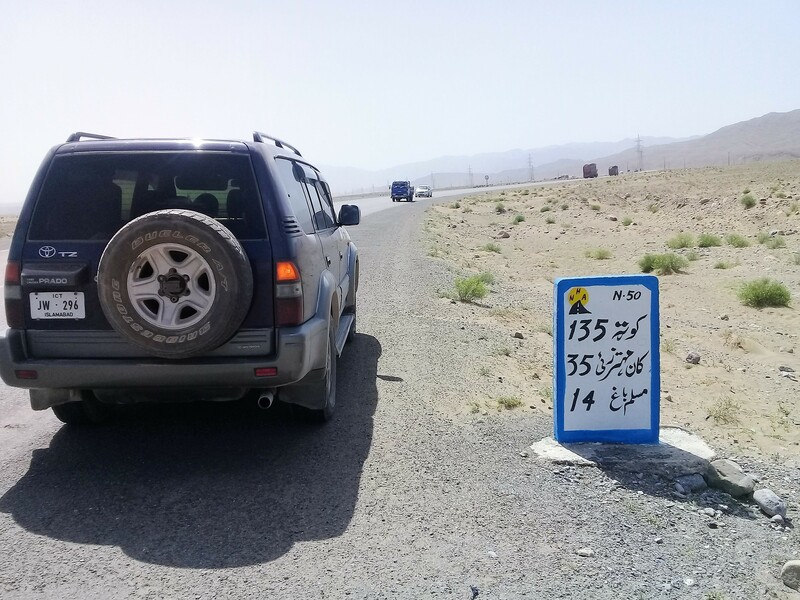 The trip meter was at 1276 km, indicating our 361 km travel in Prado after reaching Quetta. 4.25. 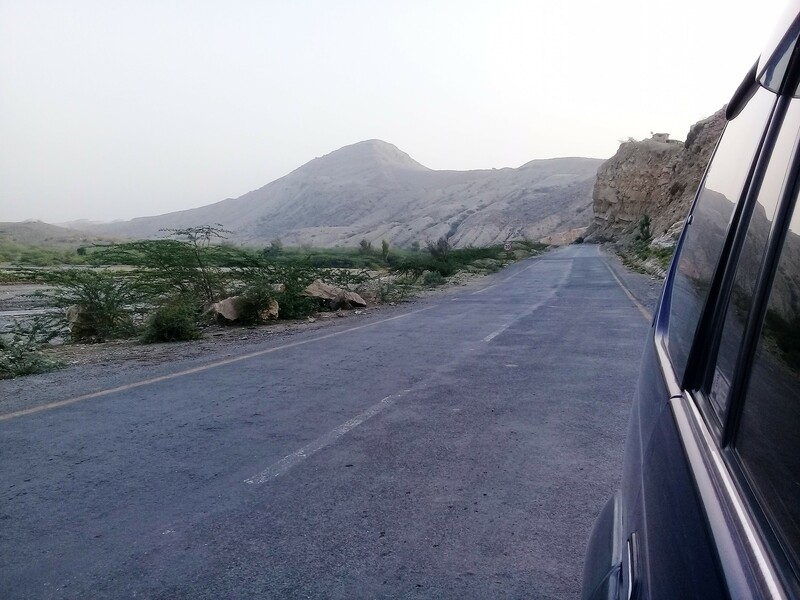 On Friday morning, 4th May, at 6:45 am, trip meter at 1276 km, our memorable visit of Quetta ended and we left Quetta for Islamabad. Departure on Friday was pre-planned because there is no construction work carried out on Fridays on Koh-e-Suleman section. After 4 hours, trip meter at 1610 km, we were in Zhob at 10:45 am. Our nice and generous friend Mehmood Khan was waiting for us. We again passed a memorable session with his friendly family and had wonderful tea along with tasty Biryani and a number of add-ons. 4.26. 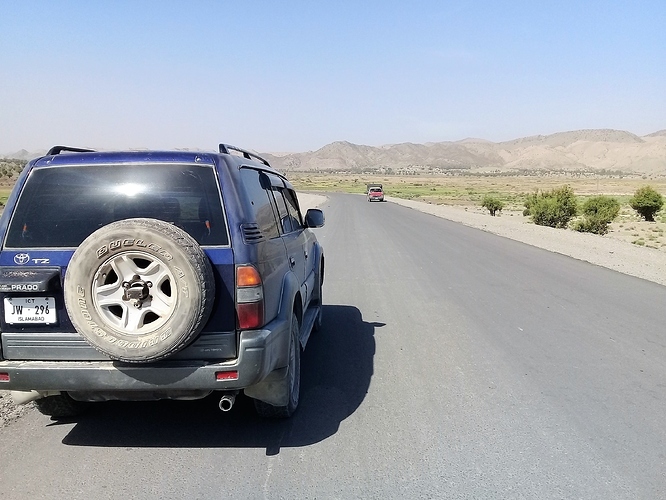 We left Zhob at 1:00 pm, after refilling of Diesel tank, crossed Mughal Kot at 03:20 pm (1700 km), crossed Dara Zinda at 04:20 pm (1743 km), crossed Daraaban at 04:45 pm (1765 km), and reached our rest house of Dera Ismail Khan at 05:30 pm (1820 km). We had the night-stay program, while my dear friend Tahir Saeed continued his journey to Girote Chowk after tea and prayers. 4.27. Our night stay in DI Khan, like before, was in the same rest house. 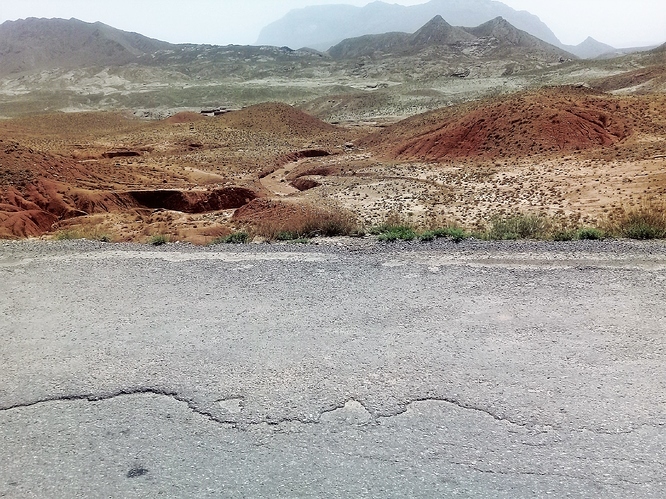 The Prado was littered with dust because of under construction road in Koh-e-Suleman region. We, therefore, managed to get our Prado washed early in the morning. Another point of concern was well-being of 5 caged chukors during the return journey. 4.28. On Saturday morning, 5th May, at 09:30 am, trip meter at 1820 km, we left our rest house at Daraaban Road, Dera Ismail Khan. This time, we did not waste our time and fuel in driving through the city center. Instead, we encircled the city through by-pass road and reached Chashma Road within 20-25 minutes. 4.29. 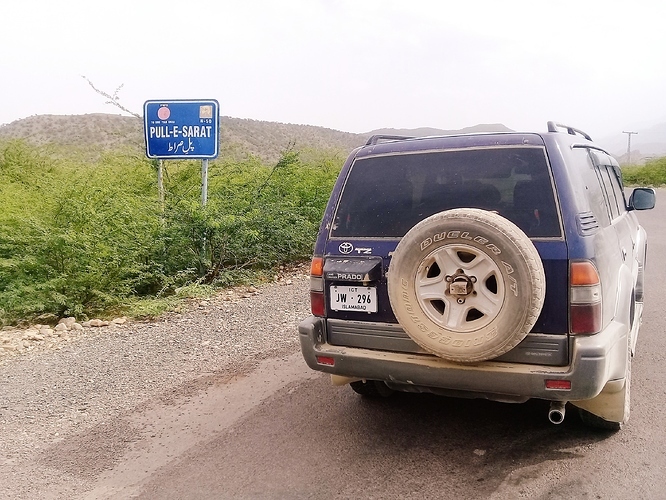 Instead of going straight to Chashma, we changed course for Pahar Pur, a town off the main road by several kilometers. In Pahar Pur, we met a family friend, enjoyed their wonderful hospitality and passed almost two hours of memorable time with that nice family. 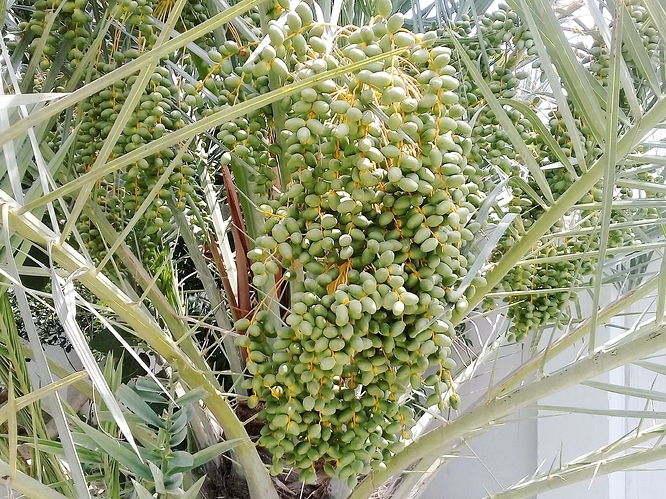 We, then, left Pahar Pur for Dhakki, famous for special breed of large dates, crossed Dhakki after purchasing of those dates and continued towards Chashma Barrage. 4.30. We finally crossed Chashma Barrage and entered Punjab, onto the petrol pump, just after the Barrage. The time was 01:15 pm and the trip meter was at 1939 km. After refilling the diesel tank and getting refreshed, we continued to Mianwali and then onward to Talagang through Musa Khel. 4.31. Our next stop, and the last one as well, was at Awan International Hotel, just short of Talagang. We stopped here from 03:45 pm to 04:10 pm (25 minutes), refreshed, had lunch, tea and prayers, all at fast track, hahaha. We crossed Talagang at 04:15 pm, 2068 km and entered Motorway at Balkasar interchange at 04:35 pm, at 2096 km. 4.32. 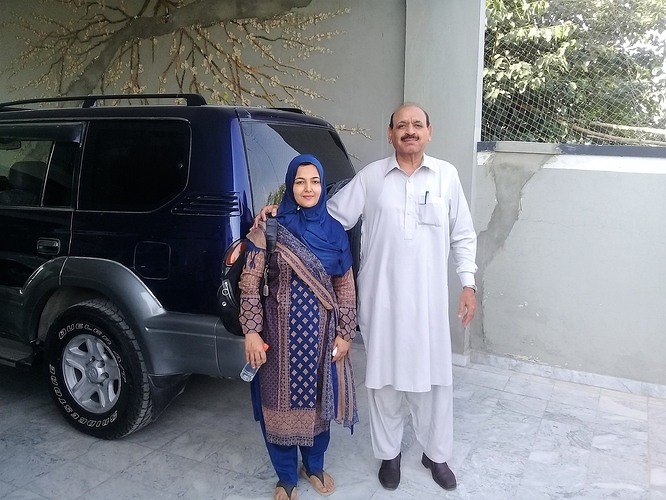 Finally, on Saturday, 5th May, 2018, safe and sound by the blessings of the Lord Almighty, we reached home sweet home, B-17, Islamabad at 2200 km and 05:45 pm. I, however, did not forget to note down the trip meter before setting it to zero and to refill the diesel tank from the Shell pump at the 1st gate entrance of Multi-gardens, B-17, to calculate the exact amount of diesel consumed on the trip as we started from the same spot with full tank, 8 days earlier. It was 2200 km trip, consuming 288 liters of diesel, costing Rs.28500 approx. The average turned out to be 7.64 km/liter and Rs.13/km. Thank God, we faced no problem with respect to our ride. However, there were other problems that need to be mentioned. 5.1	The 65-70 km road in Koh-e-Suleman mountain region between Zhob is not good, especially, the 10-15 km patch of under-construction road between Mughal Kot and Dhana-Sar is very bad and seemed a problem. Please try to travel either on Friday or cross this portion before 8 am, to avoid hours of delay. 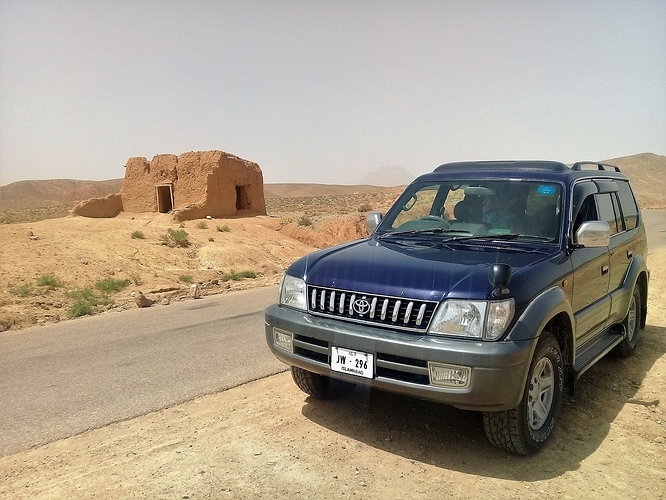 5.2	The 2nd problem is the thorough and vigorous checking of the vehicle and its documents at FC Check-post at the border of Balochistan province. 5.3	The 3rd problem was to arrange permission from army for visit of Wali-Tangi dam near Quetta. Dear Pakwheelers, I shall add pix also, in a short while. Sorry for not uploading right away. Kudos! You have burnt a lot of midnight oil. 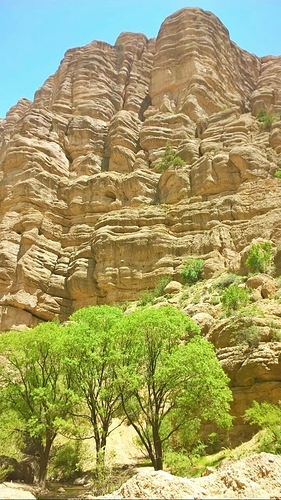 On the way to Wali Tangi dam via Urak valley, note the word "Kakar-stan"
Thank you so much. My effort is aimed at providing maximum info to interested Pakwheelers. Pix have also been uploaded. Yes, trust me, it was worth that. My pleasure dear friend. 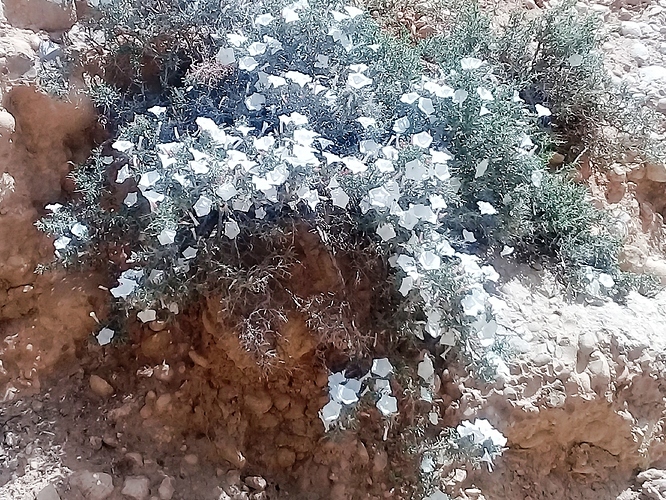 And, thanks a lot for appreciating my effort. I myself have benefited a lot from experiences shared by other Pakwheelers and my travelogues are continuation of that nice tradition. Sir. the narration is awesome. Thank you so much . I hope this will be useful for future travelers. Dear brother Hanif Bhatti, your appreciation is an honor for me. Thank you so much. May Lord bless us all. Jazak Allah, thanks a lot for appreciation. So nice of you, bro. Yes, if one got the bucks, then Prado is the best option. And, of course, Prado-1996 -2001 with 1KZ engine, in its cost range, is the best choice for Pakistan traveling.